“I was taking the recycling out to the trash can, and I saw this blue light in the sky, and I thought, that’s kinda bright to be a star, I’ve never seen a blue star be that bright,” said Kelly Castruita. “Watched it for about 10 minutes, just doing weird stuff, it would turn on and off and it would disappear,” added Kelly’s husband Jeff. “It pretty much flew, stopped, then started doing some upward motion and downward motion, so I’ve never seen anything like it,” said neighbor Randy Gabriel. “We’ll see the police helicopters once in a while, or an airplane go by, but nothing like this,” said Ricardo Pantoja, who has been living in the neighborhood for 23 years. 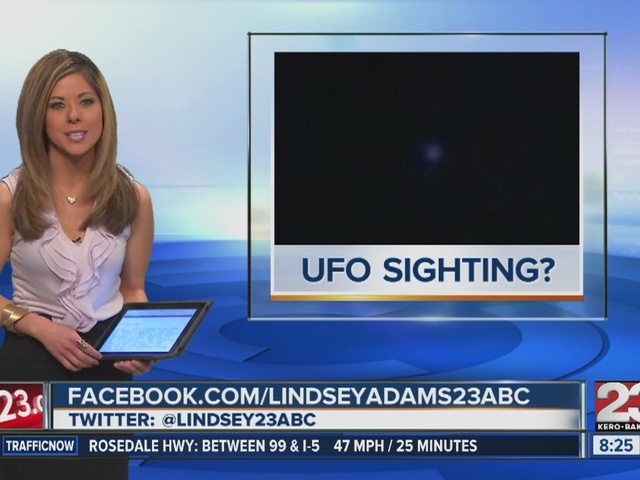 23ABC’s Lindsey Adams took the videos to Senior Deputy Victor Keesey with the Kern County Sheriff’s Department, whose office works closely in conjunction with neighboring Meadows Field Airport. “I’m not aware of any calls that we’ve received regarding any blue lights, or strange lights in that area. Very seldom, if ever, have I seen anything like it. However, we are in the age of drones now, obviously we have military drones, but we have civilian drones now and drones for purchase, so that is a possibility,” said Senior Deputy Victor Keesey. “It looked way too high up in the sky to be a drone,” mentioned witness Kelly Castruita. “It wasn’t a regular airplane or a drone, it was much bigger than what a drone would be, especially at that distance,” added neighbor Ricardo Pantoja.